Sno-Seal Original Beeswax Waterproofing protects leather from rain, sun, snow, and salt. The beeswax formula dries to a solid wax that 'stays put' in the surface of the leather so it lasts longer. Our competitors' greases, oil, and animal products are able to migrate through the leather till they clog all the pores. 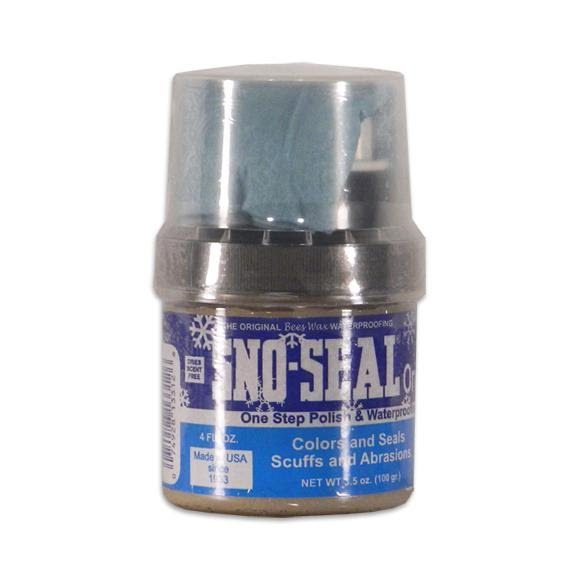 Sno-Seal Original Beeswax Waterproofing protects leather from rain, sun, snow, and salt. The beeswax formula dries to a solid wax that &apos;stays put&apos; in the surface of the leather so it lasts longer. Our competitors&apos; greases, oil, and animal products are able to migrate through the leather till they clog all the pores. These waterproofing products fill the natural spaces that are supposed to absorb perspiration and insulate. In addition, animal fats weaken and rot leather. The tannery worked hard to remove the fats and preserve the leather, so it&apos;s hard to imagine why you&apos;d put it back on. Sno-Seal will help you feel more comfortable in Gore-Tex fabric lined boots because it allows the Gore-Tex-absorbed perspiration to escape out of the leather. And not only will Sno-Seal keep you warm and dry, it&apos;ll also help you from getting tired. A typical leather boot can soak up to a pound of water. That means you lift an additional 2,212 lbs. to walk one mile. Sno-Seal keeps the whole boot dry, warm and light.